Health is often neglected with the travails of every day life. But its importance should not be ignored. A sound body empowers individuals to excel in academics. 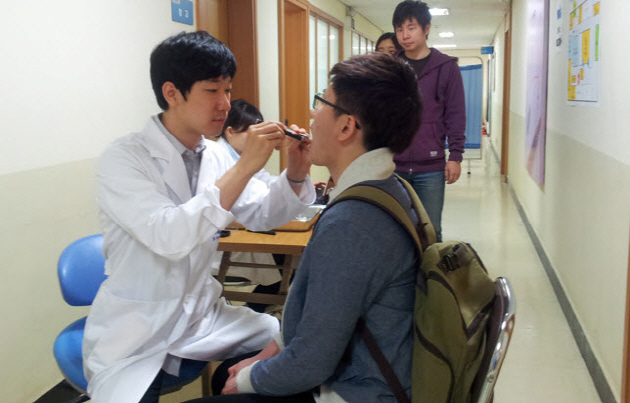 Acknowledging the importance of health for students, the Seoul National University (SNU) Health Service Center has established yearly health examinations that have become increasingly comprehensive and detailed. The student health examination allows for students to receive one free health check-up every year. All undergraduate and graduate students, including freshmen and students on temporary leave of absence, are eligible to receive the student health examination. Health examinations are held every day from 9AM until 12PM as long as students complete a prior reservation on the SNU Health Service Center website. Research students, researchers, students of the SNU Language Education Institute, or SNU students who receive health examinations more than once a year are expected to pay 20,000 Korean Won (approximately 18USD). The student health examination includes a wide range of sections for inspection. The most basic parts, such as anthropometric measurements (focused on obesity levels and waist circumference), blood pressure levels, and body composition are recorded. The health examination also encompasses a comprehensive blood test that checks for a variety of factors such as anemia, blood count, liver function, B-type hepatitis, blood sugar, cholesterol (four kinds) levels, kidney function, vitamin D levels and uric acid. Such a blood test would usually be very costly in health care centers outside of the campus. A comprehensive blood test could easily rack up to cost over 80,000KRW or approximately 72 USD. In addition to the blood test a urine test, chest radiography and eyesight test are conducted. In addition to measuring the physical factors related to an individual’s health, the health examination also concentrates on reviewing the mental health of students. A detailed survey is conducted where students are asked to choose answers on how they would respond to certain stressful situations. In this section, students are also asked to record how much junk food, cigarette, and alcohol they intake during their daily lives. The survey aims to show insights on the individual’s mental health, particularly related to the university environment. The student health examination does not end once students receive the results of each section. Students may have an appointment with a doctor in the SNU Health Service Center and review each part of the examination, which is also free of cost. The doctor provides information and advice on certain areas where students should put more effort to improve their health. Reservations can be made through the website. In addition, individuals are expected to fast for 12 hours prior to receiving the health examination.